There's nothing wrong with being slack. Some call it lazy, others may criticize it, but as long as it only affects a single person, there is nothing wrong with being slack. It's a person's choice whether or not they want to be slack, and truthfully, we are all slack at one point in our lives, it's healthy. But what happens when a company is slack? Since February 1999 Intel has released a total of four Pentium III processors, the 450, 500, 550, and 600, none of which have offered considerable performance improvements over the previous generation of CPUs for most enthusiasts. For this reason, most enthusiasts that are budget conscious are still running their old Pentium IIs or Celerons since there isn't an important reason to upgrade. What separates a Pentium III from a Pentium II is very little, nothing that would make a user wake up and say "I need a Pentium III." In summary, Intel has been very slack. From the standpoint of competition, they have had every right to be because, AMD has previously only been around to compete with Intel on the low-end. Intel didn't have to worry about AMD's K6-III intruding on their share of the server market, they didn't have to worry about the K6-2 stealing the territory of their Dual Pentium III systems in the 3D modeling/rendering arena, and they had no fear that AMD would be competing with them on a clock for clock basis anytime soon. If left unchecked, a company will continue to adhere to a roadmap that doesn't offer any groundbreaking achievements unless there is a demand for one. AMD saw this opportunity and is taking advantage of it for as long as they can. 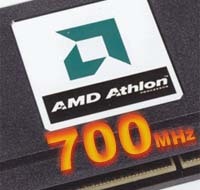 Since the release of the Athlon in August 1999, AMD has already announced 5 clock speeds, the fifth coming on the publication of this review. Intel never had to worry about AMD competing on a clock for clock basis before but, the tables have turned, and AMD is the first desktop CPU manufacturer to publicly hit 700MHz and they're doing it with style. Welcome to the world of the Athlon 700. The yields on the Athlon (the percentage of usable/marketable CPUs out of the number of CPUs produced) have been incredible. Since before the release of the K5, the Athlon is the highest yielding CPU AMD has produced for public release. Athlon systems are appearing on store shelves and they aren't costing a fortune either. A fully fledged Compaq system based on the Athlon 600 is retailing for around $1500, and considering that the CPU can easily outperform anything on Intel's side of the field, that price isn't bad at all. The 650MHz Athlon parts are slowly but surely filtering down into the hands of the public as well. Not only does the 22 million transistor CPU have no problem hitting the 650MHz mark, a clock speed higher than the fastest Intel CPU currently available at the time of publication, it is already at the amazing 700MHz point and climbing. All of this on a 0.25-micron fabrication process that is just beginning to show the signs of reaching its limits, the Athlon has some room to grow. AMD had originally not planned to release the 700MHz Athlon this early in the product release, but with the good yields on the Athlon, it seems as if the 700 and 750MHz marks are not impossible targets at all. This is very good news for AMD and bad news for Intel, who is in the middle of a die shrink down to 0.18-micron in order to compete with the clock speeds already offered by the Athlon.